Wound healing has been studied as long as there has been damage to skin and the supporting tissues. Wounds should heal naturally but hunter-gatherers would have noticed that certain factors favor or even speed up wound healing. These include the arresting of bleeding, the necessity of hygiene, the assistance of wound dressing techniques and even early surgical methods of approximation of the wound edges. Figure 2. Non-Healing Wound – Wound is over area of motion (shoulder joint). Wound is chronic – scar tissue present, wound edges are white (not pink) and have stopped trying to heal – exhaustion of healing effort. 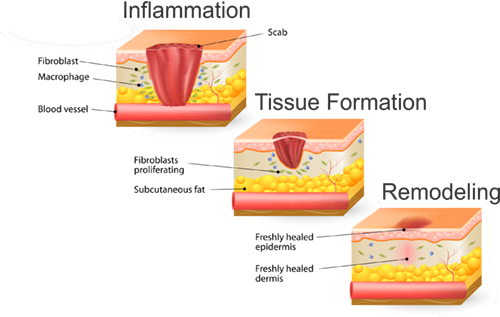 Today we know that wound healing goes through three overlapping stages: the inflammation stage, the tissue formation stage and the remodeling stage. See Figure 1. In most cases the healing process occurs in a predictable time frame and needs little attention. Non-healing wounds are those that do not follow this prescribed formula, persisting as a threat to the function of the pet or even the very existence of the pet. Regardless of the cause, be it, infection, poor blood supply, motion of the area, or exhaustion of the healing ability of the tissue, non-healing wounds pose a threat that must be addressed. See Figure 2.Many current therapies involve the application of antiseptics, antibiotics, antifungals, hyperbaric oxygen therapy, electrical stimulation and various natural remedies and bandages, all of which are potentially toxic to the very cells that are trying to proliferate to cover the defect. These approaches have not met our expectations and, as a result, there is no effective traditional approach to chronic wound management. Figure 3. Immune cell activation process. 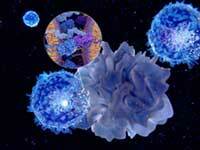 Stem cells supress the immune activation and inflammatory response to tissue damage. 1. Immune-Modulation – Figure 3. The inflammatory phase is a protective phase that causes the wound to be infiltrated with white blood cells that release digestive enzymes designed to destroy invaders of the wound. These enzymes however also digest the supporting matrix of the skin tissue, called the extracellular matrix (ECM). Once it is destroyed, the “blueprint” for healing and rebuilding the damaged tissue is lost. Application of ADSCs suppresses this inflammation and promotes healing. All chronic wounds have a certain degree of ongoing inflammation that is beneficial to suppress, but suppression of this inflammation alone will not be enough to cause the wound to heal. Figure 4. Adipose Derived Stem Cells divide to form keratinocytes (skin cells). 2. Tissue Replacement – Figure 4. The dermal cells in non-healing wounds are deficient in their ability to divide, migrate and produce the ECM, thus the applied ADSCs must supplement this function. The cell type we are discussing is called keratinocytes, and Stem Cells convert themselves into new keratinocytes adding cells (tissue) to the healing process. Figure 5. 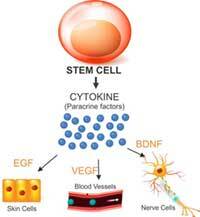 Stem Cells produce growth factors EGF, VEGF and BDNF to support skin healing. 3. Secretion of Paracrine factors (growth factors) – Figure 5. to promote the healing stages. ADSCs produce a hormone called epidermal growth factor (EGF) that stimulates the existing cell population to restart their healing processes. While skin cell growth is important, it is not sufficient alone to heal these wounds; nerve growth, as well, must occur if the tissue is to be complete. ADSCs produce large amounts of a substance called brain-derived neurotrophic factor (BDNF). BDNF is important in stimulating the growth of neurons which are essential in the healing of new skin. Many wounds lack the proper blood supply to heal and stem cells also produce a neo-angiogenic factor that recruits new blood vessels into the area to feed the newly stimulated cell growth. This factor is called vascular endothelial growth factor or VEGF. Figure 6.Platelet Rich Plasma is created from whole blood. 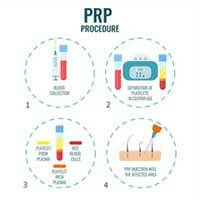 PRP is then used along with Stem Cells. The purpose of the PRP is to stimulate resident stem cells. 4. 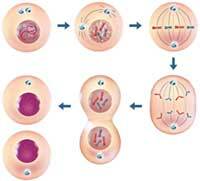 Mobilization of the resident progenitor cells (stem cells in the tissue already). While the addition of stem cells to a chronic non-healing wound promotes the growth of new cells, the rejuvenation of old cells and the formation of new nerves and blood vessels, it has been shown that just the addition of stem cells alone is not sufficient for the healing of the most severe wounds. Stem cells applied along with the regenerative product called PRP (Platelet Rich Plasma) is, however, a complete solution for the stimulation of the healing of these most severe wounds. PRP contains many of the same growth factors released by stem cells, plus many others that stimulate growth and modulate inflammation. Figure 6. All of these factors and cells together promote the management of inflammation, cell migration, blood vessel growth and tissue remodeling necessary to reach the goal of healing the non-healing wounds.